What is sinus surgery? Is it painful? What do the sinuses look like (pictures)? How do you prepare for sinus surgery? What happens before surgery? What happens after sinus surgery (pictures)? How long does it take to recovery from sinus surgery? When shouild you call you surgeon for complications following sinus surgery? Dr. Shah obtained his BA/MD from Boston University and completed his Otolaryngology residency at Tufts University followed by a fellowship in Pediatric Otolaryngology at Children's Hospital Boston at Harvard University. After fellowship, he joined the faculty of Children's National Medical Center in 2006. Dr. Shah is an active clinical researcher and has received numerous awards for his research. Traditional sinus surgery removes diseased or obstructive sinus tissue resulting in improved natural sinus drainage. Post-operative care is as important as the sinus surgery. 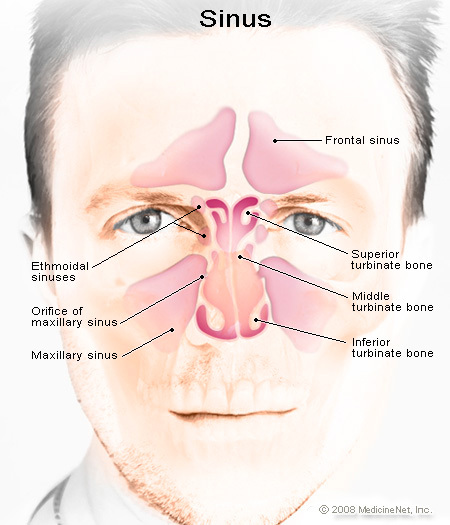 Balloon sinuplasty or sinus ostial dilation surgery is a newer method to address sinus disease. It involves expanding the natural drainage openings of the sinus passages. It is an approved, safe procedure that may be done in the operating room or office setting for some patients. Before surgery, you need to refrain from eating and drinking (including alcohol) for 8 hours before your surgery, have no fever, and have arranged for someone to bring you to, and from the hospital. On the day of surgery, you should have all paperwork and meet the anesthesiologist, and you should only take the medication approved by the surgeon and anesthesiologist. The surgery may take several hours. After sinus surgery, most people can go home accompanied by a friend or relative. Rest with the head elevated is along with an icepack wrapped in a towel to stop any bleeding that commonly occurs. Recovery may take about 3 to 5 days. Take your prescribed medications and avoid any strenuous activities until cleared to do so by the surgeon. Follow-up care is critical for recovery; keep all appointments and follow instructions in regard removing nasal packing and especially instructions on nasal irrigation (many surgeons request patients to remain in the area for 3 weeks after surgery in case any problems develop). Increased swelling of nose or eyes and thin clear fluid draining from the nose. Self-care and prevention of complications include maximizing moisture in the nose (moisturize frequently), moisturizing sprays such as "Ocean Spray" are useful), avoid allergens; and the flu (make sure flu shots are up-to-date). If the sinus surgery is in the office-based setting or the balloon sinuplasty method is used, the surgeon and clinical team may have you refrain from eating and drinking if sedation is used. In some cases, the procedure may be done under local anesthesia only. Recovery on the day of balloon sinuplasty is usually quicker than with general anesthesia. The post-operative recovery will also take several days, include nasal irrigation, and include follow-up in the office. It is important to note that balloon sinuplasty has not been shown to be superior to traditional sinus surgery regarding the long-term outcome for patients and the elimination or recurrence of disease. Traditional sinus surgery involves the precise removal of diseased sinus tissue with improvement in the natural drainage channels by the creation of a pathway for infected material to drain from the sinus cavities. In most situations, the surgeon will employ endoscopic techniques that allow better and more precise visualization without the need for external incisions. As a result, there is less swelling, bleeding, and discomfort, and a faster recovery from sinus surgery. Sinus surgery, unlike other types of surgery where a diseased part or organ is removed, involves the re-routing of existing sinus pathways in addition to removal of diseased tissue. It cannot be emphasized more strongly that post-operative care is as equally important as the surgery itself. One of the most common causes of failure of this procedure is poor post-operative care and follow-up. The doctor can only do so much. It is up to the patient to share in the responsibility of caring for this chronic illness. The following instructions are designed to help patients recover from sinus surgery as easily as possible and to prevent complications. It is very important that patients read these instructions or those provided by their surgeon and follow them carefully. This information is provided to help people prepare for sinus surgery and to help them understand more clearly the associated beliefs, risks, and complications of sinus surgery. However, ask your doctor if you have questions to help you better understand the procedure. The following complications of sinus surgery have been reported in the medical literature. This list is not meant to be inclusive of every possible complication. It is here for patient information only - not to make patients overly concerned - but to make them aware and more knowledgeable concerning potential aspects of sinus surgery. The surgeon will review the risks and benefits of the surgery when obtaining consent for the operation, and will be able to discuss the chance of these complications with respect to an individual's potential risks of surgery at that time. Bleeding. In very rare situations, a need for blood products or a blood transfusion may be required. Patients have the right, should they choose, to have autologous (using their own stored blood) or designated donor blood prepared in advance in case an emergency transfusion is necessary. Patients are encouraged to consult with their doctor regarding these issues if they are interested. Chronic nasal drainage or excessive dryness or crusting of the nose. Need for further and more aggressive surgery. Failure to improve or resolve concurrent respiratory illness such as, but not limited to, asthma, bronchitis, or cough. Failure to resolve associated "sinus or nasal" headaches. The exact cause of headaches can be difficult to determine and may have many different causes that are not sinus-related. The patient or physician may require consultation with another specialist such as a neurologist. Damage to the eye and its associated structures. Damage to the skull base with resultant meningitis, brain abscess, or leakage of spinal fluid. Nasal obstruction due to failure to control infection or polyps. Failure to restore or worsening of the sense of smell or taste. In most situations, the surgery is performed as an outpatient at either the hospital or a surgical center (surgicenter). In both facilities, quality care can be provided without the inconvenience of an overnight stay. An anesthesiologist will review the patient's medical history before surgery, and will monitor the patient throughout the procedure. If the doctor has ordered pre-operative laboratory studies, the patient should arrange to have these done several days in advance, and bring all lab results to the hospital the day of surgery for review. Arrange for someone to spend the first night after surgery with the patient, if possible in case the patient needs to remain overnight. After surgery, the doctor will usually advise the patient to start using saline irrigation. 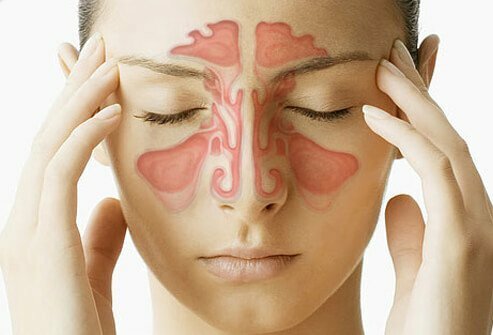 There are many different ways to irrigate the sinuses; depending on the surgery that was performed, the surgeon will advise the patient on the best method for this to be done. In general, patients that have sinus surgery should not take aspirin, or any product containing aspirin, within 10 days prior to the date of surgery. Nonsteroidal anti-inflammatory medications (such as Advil) should not be taken within 7 days of the date of surgery. Many over-the-counter products contain aspirin or Advil-like drugs. Therefore, it is important to check all medications carefully. If there is any question, call the doctors that prescribed the medications (surgeon, primary care physician, cardiologist or other specialists) or consult your pharmacist. Depending on the planned surgery, the surgeon may have the patient refrain from such medications for a longer periode. Acetaminophen (Tylenol) is an acceptable pain reliever. Usually the surgeon will give prescriptions for post-surgery pain medications at the preoperative visit. It is best to have these filled prior to the date of surgery. In most pre-operative preparations, patients must not eat or drink anything 8 hours prior to the time of surgery; the surgeon or hospital/surgicenter will let the patient know the specific details regarding what time to stop eating and drinking. This includes even water, candy, or chewing gum. Smokers should make every effort to stop smoking, or at least reduce the number of cigarettes as much in advance of surgery as possible. This will help to reduce postoperative coughing and bleeding. If a person is sick or has a fever the day before surgery, they should inform the surgeon. If a patient wakes up sick the day of surgery, still proceed to the surgical facility as planned. The surgeon and the anesthesiologist will decide if it is safe to proceed with surgery. It is important that patients know precisely what time they are to check-in with the surgical facility, and that they allow sufficient preparation time. Bring all papers and forms, including any preoperative orders and history sheets. Wear comfortable loose fitting clothes that do not have to be pulled over their head. Leave all jewelry and valuables at home, including earrings, watches, rings, etc. Remove all make-up with a cleansing cream. Patients should thoroughly wash their face with soap and water. Do not apply make-up or cream to the face. If possible, avoid using hair clips or other materials to hold up hair. Do not take any medication unless instructed by the doctor or the anesthesiologist. Usually, in the pre-operative holding room, a nurse will start an intravenous infusion line (IV) and the patient may be given a medication to help them relax. In the operating room, the anesthesiologist will usually use a mixture of a gas and an intravenous medication to put the patient to sleep and to maintain anesthesia at a safe and comfortable level. During the procedure, the patient will be continuously monitored. The surgical team is prepared for any emergency. In addition to the surgeon and the anesthesiologist, there will be a nurse and a surgical technician in the room. The whole procedure usually takes several hours. The surgeon will come to the waiting room to talk with any family or friends once the patient is safely in the recovery room. After surgery, the patient will be taken to the recovery room where a nurse will monitor the patient's vital signs. Usually, patients will be able to go home the same day as the surgery once they have fully recovered from the anesthetic. This usually takes several hours. Patients will need a friend or family member to pick them up from the surgical facility. Someone (a responsible adult) should spend the first night after surgery with the patient in case any post-surgical problems develop. On arrival at home from the surgical facility, the patient should go to bed and rest with their head elevated on two to three pillows. By keeping the head elevated above the heart, edema and swelling from the sinus surgery can be minimized. Patients may get out of bed with assistance to use the bathroom but should avoid straining with bowel movements because this may cause some surgical site bleeding. If the person is constipated, they should take a stool softener or a gentle laxative. Some patients may have noticeable swelling of the nose, upper lip, cheeks, or around the eyes for several days after surgery. This swelling is normal and will gradually go away. People can help reduce it by putting an ice pack on the face, bridge of the nose, and eyes as much as tolerated. This will also help with postoperative edema and pain. Some patients have found frozen vegetables in packages (for example bags of frozen peas) to be a convenient ice pack which nicely conforms to the face. The frozen material should be separated from the skin by a towel or similar barrier to avoid any skin damage. Many clinicians suggest periods of 15 minutes of such ice-pack treatment followed by 15 minutes of removal to not damage the skin. Moderate bleeding from the nose is normal, and will gradually decrease. 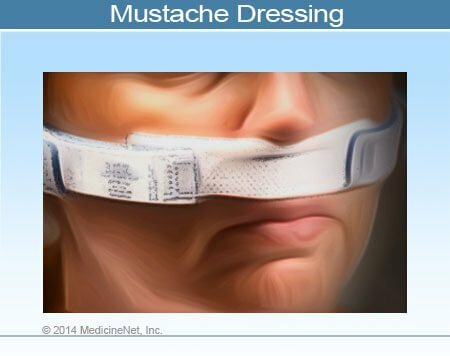 The gauze dressing ("mustache dressing") will collect blood and should be changed as needed. It is not unusual to change these dressings every hour during the first 24 hours after surgery. It is recommended to purchase gauze pads prior to surgery so that the patient will have enough for dressing changes. After a few days the patient will probably not need to use the dressing any longer. Do not take aspirin, aspirin-containing medications, or nonsteroidal anti-inflammatory medications (such as ibuprofen/Advil, Naprosyn, and others) for as long as the surgeon has instructed following surgery, because such medications may increase bleeding and slow clotting at the surgical site. It is best to eat a light, soft, and cool diet as tolerated once the patient has recovered fully from the anesthetic. Avoid hot liquids for several days. Even though people may be hungry immediately after surgery, it is best to go slowly to prevent postoperative nausea and vomiting. Occasionally, patients may vomit one or two times immediately after surgery. If vomiting persists, please contact the surgeon; the doctor may prescribe medication to reduce or eliminate vomiting. It is important to remember that a good overall diet with ample rest promotes healing. Patients may be prescribed antibiotics after surgery, and should finish all the pills that have been ordered. Some form of a narcotic may also be prescribed and is to be taken as needed for pain. If the patient requires narcotics, they should not drive and should consider having a responsible person stay with them. In some situations the doctor may give steroids to be taken either before and or after surgery. Take this medication as prescribed, and not discontinue it prematurely. The steroids are instrumental in facilitating proper healing. If patients have any questions or they feel that they are developing a reaction to any of these medications, he or she should consult their doctor immediately. Patients should not take any other medication, either prescribed or over-the-counter, unless they have discussed it with the doctor. Depending on the extent of the surgery, recovery may take a few days. It may take up to 3 to 5 days to feel completely back to normal. Patients should refrain from activities that increase heart rate or blood pressure such as running, exercising, weight lifting, or other similar activities. It is imperative to obtain guidance from the surgeon as to when they may resume all normal activities. Until this time, patients should rest and limit physical exertion. In many cases, packs or nasal packing is placed in the nose to control postoperative bleeding. The surgeon will tell the patient when to return to the office to have these packs removed. Patients may need to call the office to schedule this postoperative appointment. Please arrange for someone to drive the patient to and from the office for this first visit in case any complications (for example, additional bleeding) develop. Patients should eat a light meal before coming, and avoid taking excessive pain medications. In addition, most patients will also have several subsequent office visits scheduled to assess healing, remove crusts, and insure a speedy recovery. These visits are very important as the surgeon may use the endoscope (camera to look in the nose) to clean up the sinuses and perform further debridement if necessary. This post-operative surveillance by the surgeon is very crucial in the individual's long-term success with the surgery. After the packing has been removed, individuals may breathe through their nose, but should not blow or sneeze through it for 7 to 10 days to reduce the chance of bleeding. If a person must sneeze, they should try to sneeze through an open mouth. Many surgeons tell patients to expect some light blood-tinged drainage from the nose for several days. If bleeding becomes excessive, apply an ice pack (described previously) and rest quietly with head elevated while applying mild to moderate pressure to the nose. If bleeding continues, call the doctor's office. One of the most important things patients can do after surgery is nasal irrigation. Immediately after the nasal packs are removed patients should use a saline nasal spray such as "Ocean Spray" several times per day to prevent crusts from forming in the nose. The surgeon will tell patients when to discontinue the nasal spray and will let them know the best way to irrigate the sinuses. Patients should go back to work or school only when the doctor says you can and should plan on resting for several days following surgery. Avoid excessive talking, smiling, hard chewing, strenuous activities, and lifting heavy objects, bumping the nose, and bending over. Try not to rest eye glasses on the bridge of the nose until soreness and swelling subside. People may wear contact lenses once eye swelling and any eye irritation has resolved. Alcohol and tobacco should be avoided because they may prolong swelling and healing. Smoke, dust, and fumes may irritate the nose and cause an infection. In general, people may use usual make-up any time after surgery, as long as the structures (for example, eyelids) with make-up are relatively normal and are not irritated by the application of make-up. Be gentle while brushing the upper teeth. They will often be tender for several weeks, and some people may have some numbness of the teeth and palate for several months. Patients should plan to remain in the general area where the surgery was performed for 3 weeks to allow for postoperative care and in case bleeding occurs, the patient can be seen by the surgeon that did the procedure and who should best be able to treat the patient. A fever greater than 101.5 F (38.6 C) that persists despite increasing the amount of fluid intake and acetaminophen (Tylenol) use. Persistent sharp pain or headache that is not relieved by the prescribed pain medication. Drainage of a thin, clear fluid in large quantities from usually only one side of the nose. This would be different from the clear, thicker mucus drainage normally produced by the nose. Maximize Moisture. Patients should always remember to maximize moisture in their nose. Keeping sinuses moist makes mucus thinner, allowing the sinuses to drain better. This drainage in turn helps prevent infection. Use a humidifier, drink plenty of water, avoid drying substances such as alcohol and caffeine, try to avoid smoke, which dries out sinus linings, and use plenty of saline irrigation. Avoid Allergy Particles (Allergens). People may want to wear a mask when they clean or are exposed to dust. Sit in the non-smoking sections of restaurants. Avoid exposure to pollens during peak season, and keep an air-conditioner on during allergy season. Prevent Colds. Avoid exposure to colds and flu whenever possible; obtain a yearly flu vaccination. Patel, A, MD, et al. Functional Endoscopic Sinus Surgery. Medscape. Updated: Mar 02, 2016. Welch KC, Stankiewicz JA. A contemporary review of endoscopic sinus surgery: techniques, tools, and outcomes. Laryngoscope. 2009 Nov;119 (11):2258-68. How long was the recovery period of your sinus surgery? Share your experience with sinus surgery. Was your sinus surgery painful? Was it painful after surgery?